This website (Wise Guys) was developed by East Sussex Trading Standards Service in partnership with Brighton & Hove and Milton Keynes Trading Standards Services. Wise Guys aims to provide teachers with a comprehensive resource to deliver parts of the citizenship/PSHE curriculum to students in special schools. The primary objective of the Wise Guys website is to educate students with learning disabilities on life skills, to empower them to become informed confident consumers. The Wise Guys website contains comprehensive lessons covering Key Stage 1-4. It has been designed to fit in with the citizenship and PSHE curriculum. The lesson covers subjects such as making choices, rules, healthy living, keeping safe, what Trading Standards does and the role of Europe. These are just a few of the subjects covered. For more information please view the teaching resources. Wise Guys has been developed with guidance from teachers and students to ensure that it is suitable for use in and outside of the classroom. 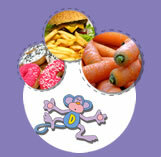 Di Lemma the monkey will help students understand all the different subject areas by making the topics come to life. The students can follow Di Lemma’s, dilemmas in the student handouts contained in each lesson. Wise Guys will help to educate young consumers about their rights and responsibilities; it will assist them to become empowered citizens and encourage them to contribute to society in a positive way. We will make regular checks to ensure that materials and resources are updated, so that they are kept in line with changes in legislation or the curriculum. If you have any comments about the site and its content or you find any inappropriate material or dead links within the site please email us at Wise.Guys@eastsussex.gov.uk. This site is designed for teachers to teach young people about life skills. Teachers can view the teaching intentions, teaching notes, student handout and activities or download the complete lessons. Website design © FAT promotions 2008. All rights reserved.